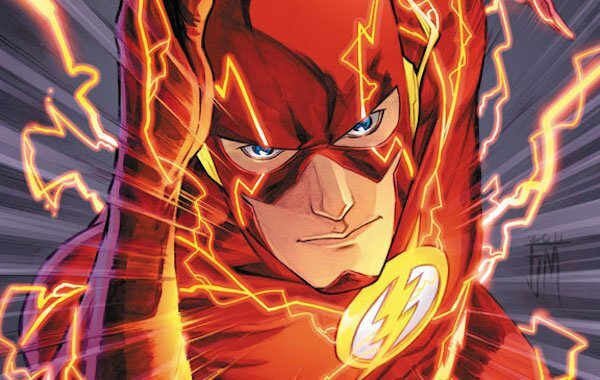 How Long Is Ezra Miller Willing To Play The Flash? Warner Bros. had a few extra surprises to go along with their DC film slate announcement back in October, namely the casting of Ezra Miller as Barry Allen, a.k.a. The Flash. This will be Flash’s first theatrical appearance (excluding his cameo in The LEGO Movie), and the character is set to be a major player in the DC Cinematic Universe. While it will be a few years until we see his first appearance as the Scarlet Speedster, Miller is understandably excited with becoming a superhero, so much so that he has an unusual time frame in mind for his tenure DC’s fastest crimefighter. While promoting his film The Stamford Prison Experiment at the Sundance Film Festival alongside co-star Michael Angarano, Miller told Hitfix how long he would love to play The Flash if it was his decision. "I would do it for forty years. That contract could have said anything." Obviously that statement is an exaggeration, although given that Miller is currently 22, it would be interesting to see the four-decade transition from youthful superhero to one that’s eligible to order off the senior menu at Denny’s. However, if anyone is going to grab the record of "Longest Tenure As A Superhero," it will be Hugh Jackman as Wolverine, who has played the role since 2000. Robert Downey Jr. as Tony Stark takes second place, having played the industrialist since 2008. While it’s extremely unlikely that Miller will achieve anything close to his suggested time, he will be around the DC Cinematic Universe for awhile. The Flash will be introduced in 2017’s Justice League Part One, return for his solo film in 2018 and then team up with his fellow superheroes again in 2019 for Justice League: Part Two. There were also rumors circulating last year that Flash would cameo in Batman V Superman: Dawn of Justice, although that no longer appears to be legitimate. Miller will have some catching up to do with another actor by the time he puts on the red and yellow costume. Grant Gustin currently plays Barry Allen on the CW series The Flash, and assuming that it is still on when Justice League Part One is released in November 2017, it will be in the middle of its fourth season. This will make Flash one of the few superheroes that will be seen on the big screen and small screen at the same time. Ezra Miller also reiterated how happy he was being picked as The Flash, describing the job security of playing a superhero for multiple films as "incredibly comforting," Depending on what Warner Bros. plans for the DCCU are, it’s likely that he’ll renegotiate his contract to appear in more films, meaning we’ll be seeing plenty of The Fastest Man Alive on the big screen…but not in 40 years.